Who doesn’t want to purchase high-quality products at a very reasonable price? Now that the Christmas season is fast approaching, more and more consumers try their hardest to find cheap but quality items that they will give as presents to their loved ones. One of the places that usually becomes a talk of the town where you can find the best and high-quality clothing is Taytay Tiangge. It is dubbed as the country’s garment capital so it is given that you can surely find fashionable apparel and good-quality clothes made with nothing but impressive materials – all comes at an extremely affordable price! 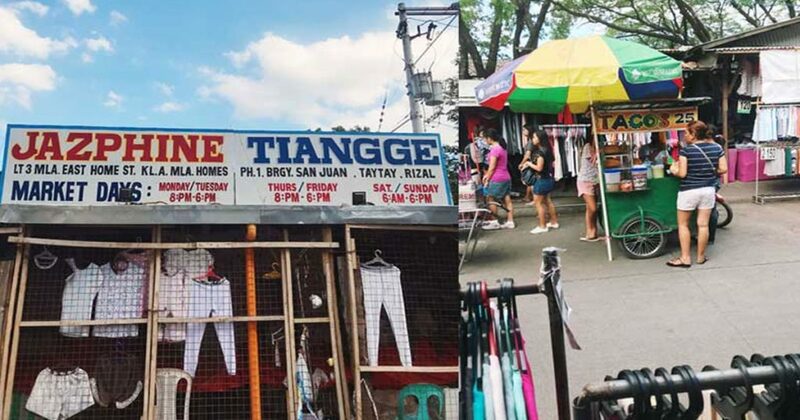 The prices of the clothes that you can find in other tiangges, bazaars or malls are twice or even thrice the prices of those you can buy in Taytay. Some of these sellers get their items/supplies from Taytay, even those being sold in Baclaran and Divisoria. A blouse from Greenhills is priced around Php150 while it is offered around Php60 at Taytay Tiangge. Most tops are available for less than Php100 while dresses, pants, and jogging pants are more or less than Php200. Clothing sold at bazaars such as Greenhills, Eastwood, other tiangges and even malls are all available at Taytay Tiangge for a more affordable price. If you’re residing near Cainta, Marikina, Rizal or in the Pasig area, don’t go far and just go straight to Taytay Tianggeto buy clothes. It’s like hitting two birds with one stone – you can avoid the heavy traffic jam while getting only the best quality clothes at a reasonable price. If you’re looking for other items such as toys, bags, shoes, school supplies, and accessories, you can also visit Divisoria because Taytay Tiangge merely offers apparels and clothes. Just like Taytay Tiangge, Divisoria is also jampacked during the holiday season. It is literally very easy to find Taytay Tiangge because it is only 3-5 minutes’ walk from the said landmarks. If you’re commuting from San Mateo, Quezon City, Marikina or from Montalban areas, it is more convenient to ride a jeepney to Taytay. You can take the ride in front of Sta Lucia East Grand Mall along Marcos Highway in Cainta, Rizal and get down at Taytay palengke or at Club Manila East. If you are coming from Pasig or Mandaluyong area, you can take UV Express van, RRCG or G-Liner bus or ride a jeepney that will pass Taytay, Rizal. You can also just ask the driver to bring you down at the exact location of the tiangge. Before you go there, make sure to make a list of the things that you are going to buy. Bring your own shopping bag so you can put all the items there. To avoid being dehydrated, bring water for refreshment and be extra careful of your belongings such as gadgets and, as much as possible, avoid wearing jewelry and fancy accessories – thieves and snatchers can be just around. Wear comfortable clothes because the area can be crowded as there’ll be a lot of people inside. Always check your change – you can bring a low-end phone or small calculator. Bring enough cash so you’ll not run out of money for things that you need to buy.